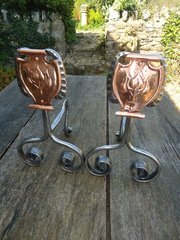 Lovely pair of Arts & Crafts steel andirons or fire dogs with copper scrolled heads with a stylised flower with three hearts. The scrolled legs tie in with the theme on the scrolled heads. 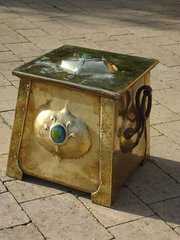 Offered in excellent condition. 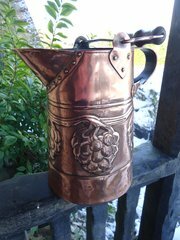 Good quality heavy and decorative items. They stand 32cms high and have a depth of 20cms and are 20cms wide. 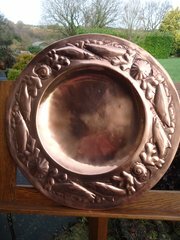 Stunning Arts & Crafts c tray by John Pearson with a wonderful border of stylised leaves and buds made in heavy gauge copper. Signed J.Pearson 1890. Offered in good condition with just a few dings to centre area. This has a later solder to the reverse where a hook has been added to hang it. It measures 48cms x 40cmswith a depth of 3cms. 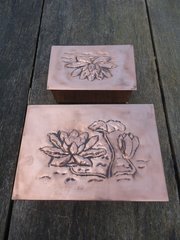 Pair of Arts & Crafts copper caskets - one being larger than the other probably made for cigarettes. They stand on brass ball feet and are offered in good condition with just the lids sitting slightly proud and a few dings to corners of lids The large one measures 23cms x 15cms with q height of 9cms and the small one is 18cms x 11cms with a height of 8cms. This price is for the pair. Postage included within the U.K.